Many Agents of the New Order prefer to operate in the New Order territories, which act as a magnet for bumpers. Other Agents prefer not to make the trek, and they bump unruly miners in the far-flung territories closer to where they already live: Think galactically and act locally, if you will. I have received reports from bumpers across Caldari highsec, and Gallente and Amarr space, as well. Minmatar highsec is the last of the remaining major "racial" highsecs, and all is quiet from Ammatar and Khanid highsec. Today's report is from an aspiring bumper who lives in the Domain region of Amarr space. Agent Reko Karppinen lives near Isamm, an ice mining system that has yet to receive the full bounty of New Order protection. I hope this report pleases you, and the fact you have Agents in your Domain Territories. Pleas forgive my poor grammar and spelling, I am a man form humble beginnings trying to make my way up in the Universe. My heart is in the right place and I am dedicated to the task. I also have big fingers, this does not help. Reko's enthusiasm for the cause outweighs any deficiency he may have in the way of typing skills, as the miners of Isamm soon learned. Reko Karppinen > Do any of the good miners in this system wish to pay now with out inquiry so that they may join the glorious new order? The behavior of Amarr space miners isn't any better than we've seen elsewhere. Reko Karppinen > doust thou wish to be written down with the red pen? Reko can also confirm that counter-bumping and the carebear stare are universal. 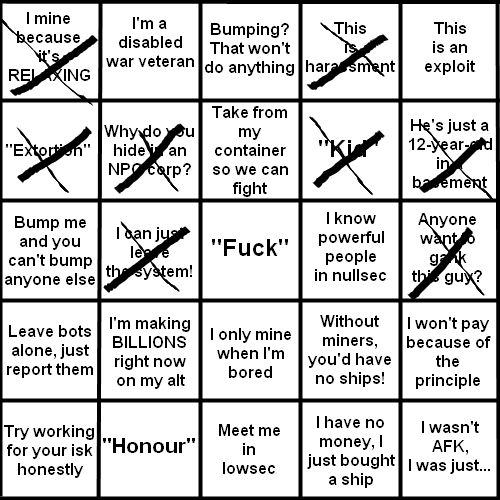 The uniform nature of the highsec miners across the galaxy does make for good Miner Bingo, however. 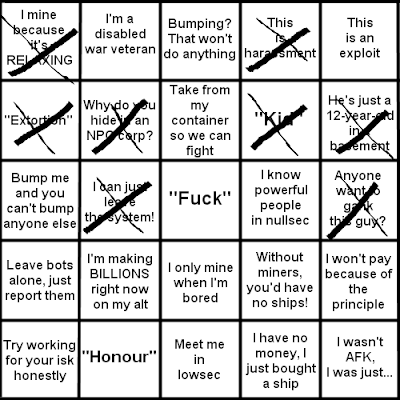 Reko was able to fill out nearly a third of the squares on his card during his visit to Isamm, but sadly, the Bingo remained elusive. Better luck next time! Provided you can manage to pay for to be charged great amount to get tag heuer watches you'll pick out special plus vibrant wanting different watches. breitling replica watches will be beneficial to all of just like to get design oriented people today, common devotees, and even those of you that likes to currently have sober appears to be like. Plus cartier replica sale is because different watches appear in sophisticated, present day, classy, cool and trendy appears to be like. At this moment let’s can come clear that is certainly this the best way plus which will make really should be most effective to get obtaining different watches. You'll want listened to a term with D&G look at. Certainly, hublot replica sale works miracles and the majority of responsible label of different watches you can get today. But not only different watches, however option in numerous such thinggs as attire, sunrays drinking glasses etcetera. fake breitling have got a superb variety of Women of all ages d&g different watches and even men D&G look at.